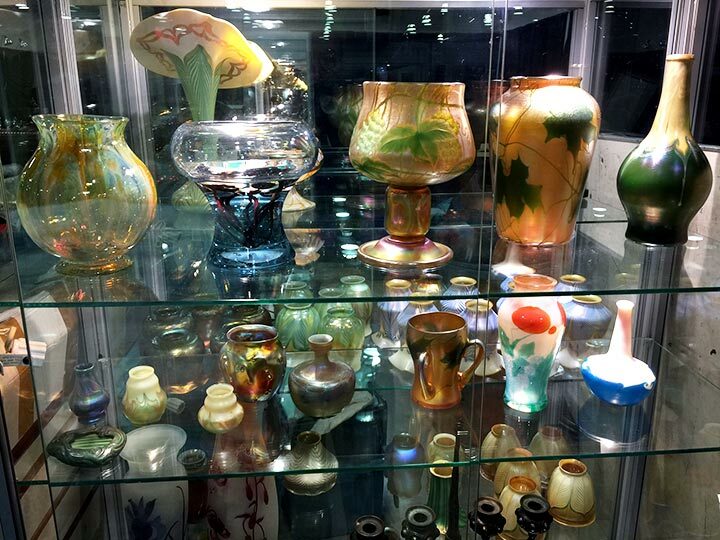 The Original Miami Beach Antique Show opens today, January 28, 2016, at noon, and will end on Monday at 5 PM. Visit the show and enjoy it at the Miami Beach Convention Center, possibly for the last time (at least that’s what a couple of the dealers are saying). 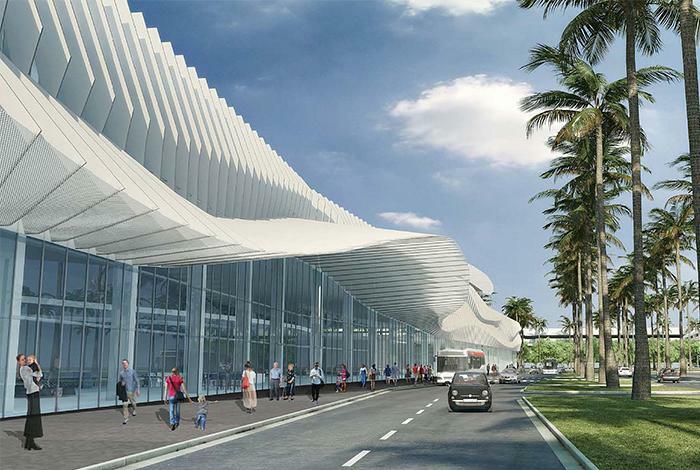 As I’ve said before, The Miami Beach Convention Center will undergo major renovations, forcing the Original Miami Beach Antique Show to move next year, 2017, and possibly more years after that. Setup was a bit different this year, having been extended to three days from the usual two. Management anticipated problems that never materialized, so setup was smooth, easy and relaxed. I was able to purchase a few very fine items to complement the already fabulous selection I brought. One of them was a real kick to find. 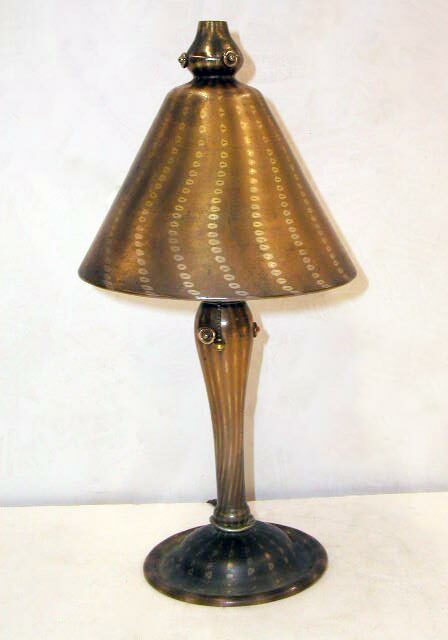 It’s an all glass Tiffany Arabian lamp that I’ve never seen in this large, 20″ tall, size. Plus it has four carved insects on the shade. Fabulous! Monday’s blog will be delayed until Tuesday, so I can tell you the results of the show. It’s one you won’t want to miss. I’ve been quite busy buying and selling recently, partly because I’ve listed many new items on my website. I need to buy more, so if you have something great, please offer it to me. I am paying the highest prices of any dealer. My decisions are quick and my payments just as quick. Just snap a photo and email me a jpeg. The Miami Antiques + Art + Design Show ended yesterday after a three-day run from January 22-24, 2016. The show started slowly on Friday, with only one sale to the public, but other sales to dealers and private clients made it a good day. Attendance was light on both Saturday and Sunday, with a commensurate lack of interest. We only made one small sale to the public on Saturday and none on Sunday. However, we did well overall, because I sent lots of photos to my private clients and they responded. If we hadn’t been at the show to find the objects and sell them by email, we wouldn’t have made the sales. Unfortunately, I didn’t have the time to poll other dealers for their reactions to the show because I was constantly on the computer taking photos, sending photos and making deals. It was time well spent. 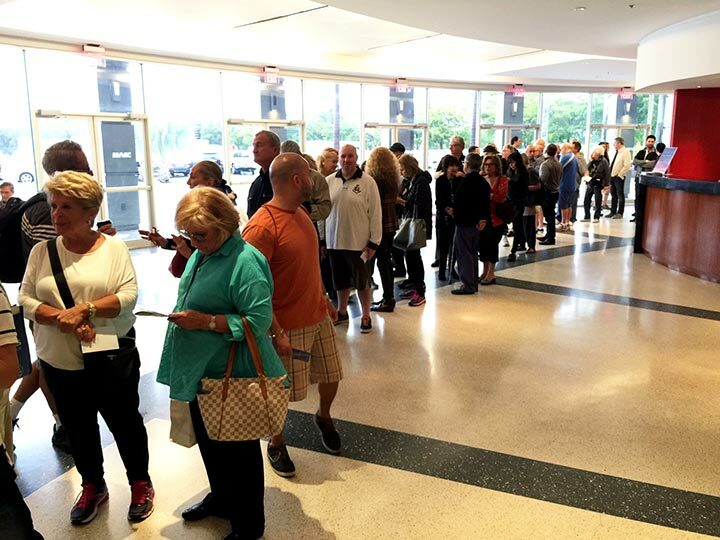 This week the highly anticipated Original Miami Beach Antique Show will open to the public on Thursday at noon, as usual at the Miami Beach Convention Center. You should attend not only because it’s a great show, but also for the memories. The show will move to the Miami-Dade County Fair & Exposition in 2017, but hopefully will return to the Convention Center in 2018, after the completion of construction. Thursday’s blog will be from the floor of the Miami Beach Convention Center. Next Monday’s blog will be delayed until Tuesday, so I can report on the results of the show. 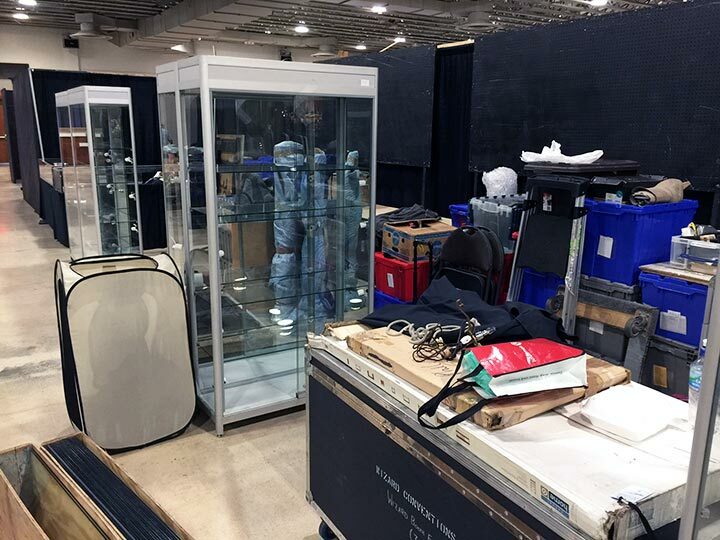 Yesterday was the first day of setup at the Miami Antiques + Art + Design Show, The Airport Show, which will open to the public this Friday, January 22, 2016 at noon. Setup went smoothly, but it’s a big job, so we only finished about half. We’ll finish today and be ready for the public tomorrow. The show is small by Miami standards, but not small by Midwest standards. The dealers are high quality, so it’s definitely worth a visit. 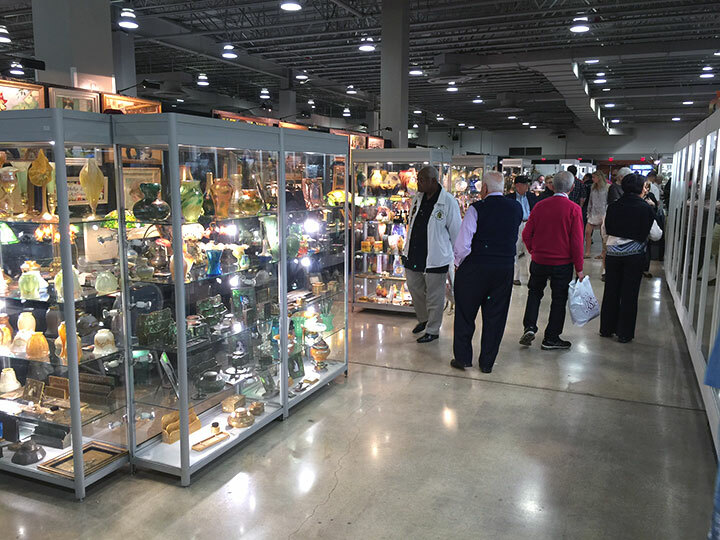 You’ll be able to see some great merchandise before these same dealers exhibit next week at the Original Miami Beach Antique Show. 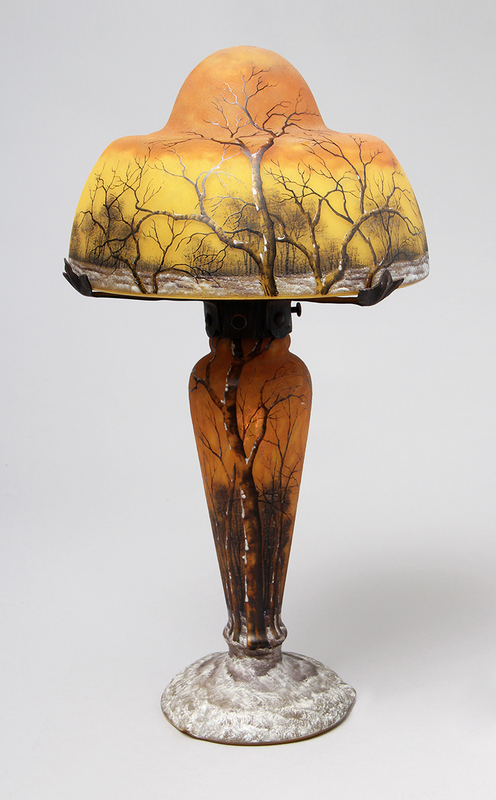 I’ve brought an incredible assortment of French and American glass and lamps — one of the best ever. I hope you’ll visit so you can get first crack. Tune in on Monday for the results of the show. The following week the Original Miami Beach Antique Show will open to the public, as usual, at the Miami Beach Convention Center. You should attend because it’s a great show, but also for the memories. 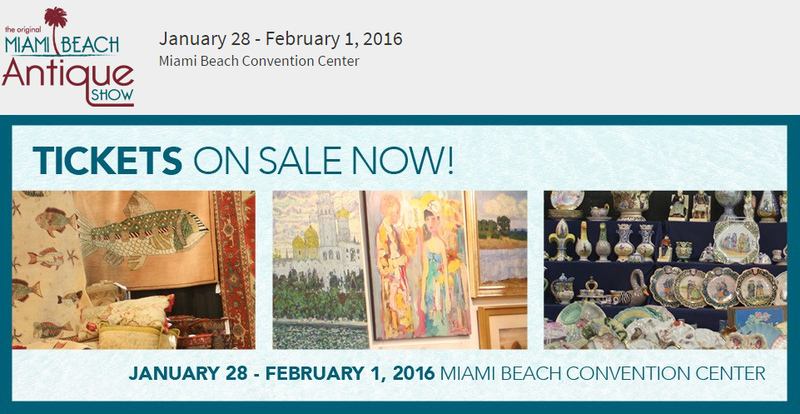 The Miami Antiques + Art + Design Show, The Airport Show, will open to the public this Friday, January 22, 2016 at noon. We’re bringing such a huge selection of fantastic merchandise that we had to leave some items home because the truck was chockablock full. 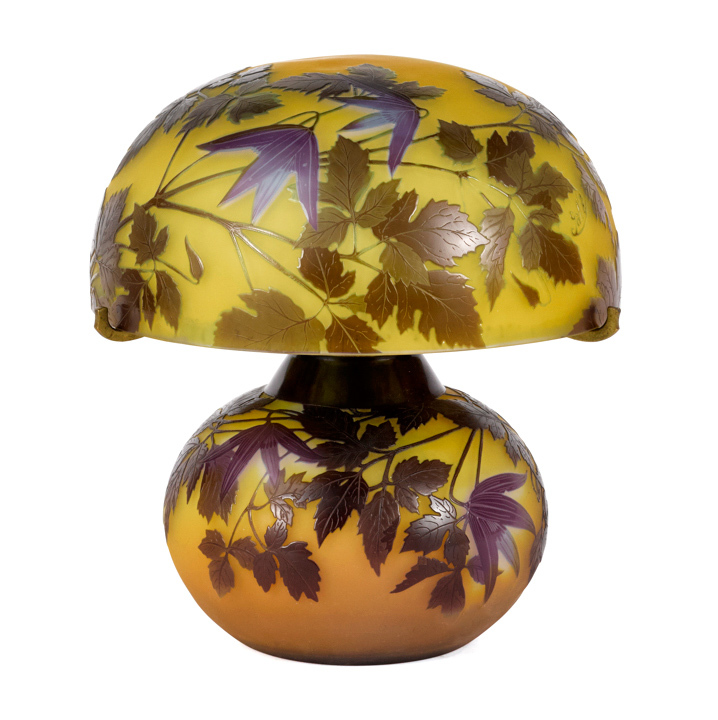 Sales of French glass have been great for the last few years, so I’m bringing a really powerful selection of Daum Nancy, Gallé and Argy-Rousseau items. If French glass interests you, you’ll want to see what I have. 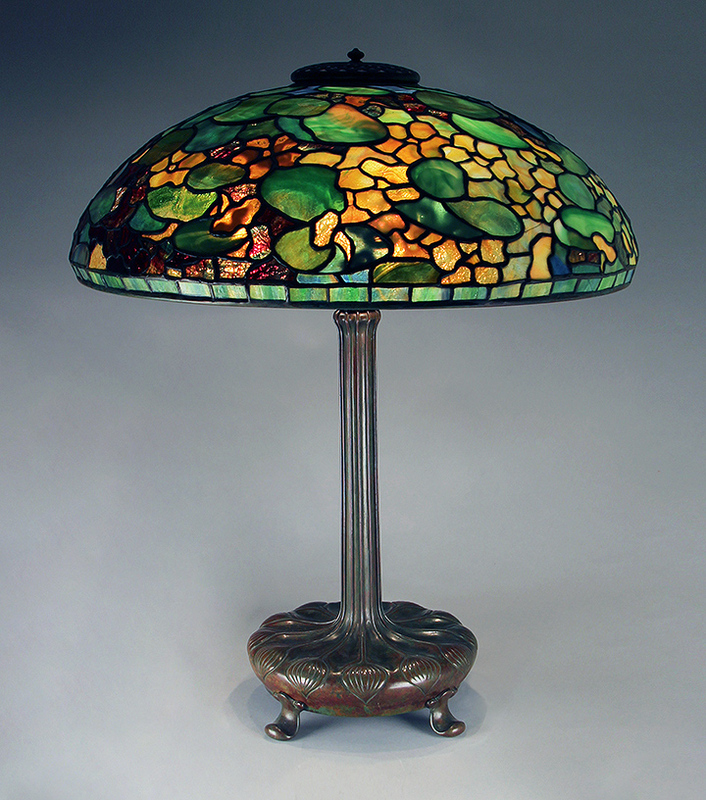 How about Tiffany Studios lamps and glass? 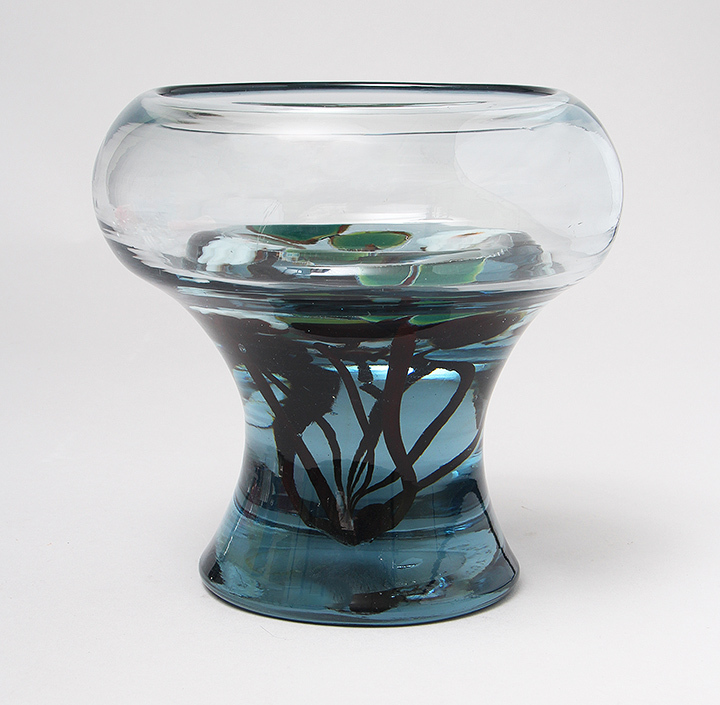 I can’t tell you what a great selection we have, from a 20″ Nasturtium lamp to an Aquamarine vase. Thursday’s blog will be from the floor of the the Miami Antiques + Art + Design Show. Can’t wait to get there and start the action! 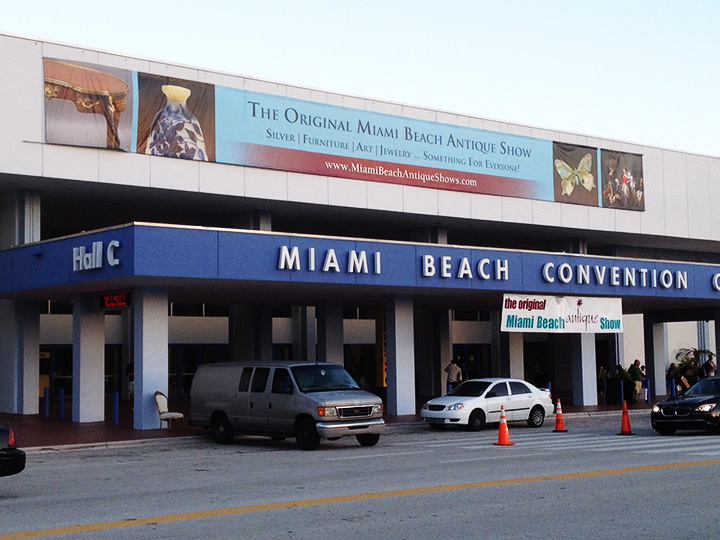 The Miami Beach Convention will undergo major renovations, again, forcing the Original Miami Beach Antique Show to move next year, 2017. The construction was to have begun last month on the $615 million expansion. Two halls will be closed during the initial phase, leaving two halls open. Construction of the convention center and adjacent hotel are to be completed in 2018. 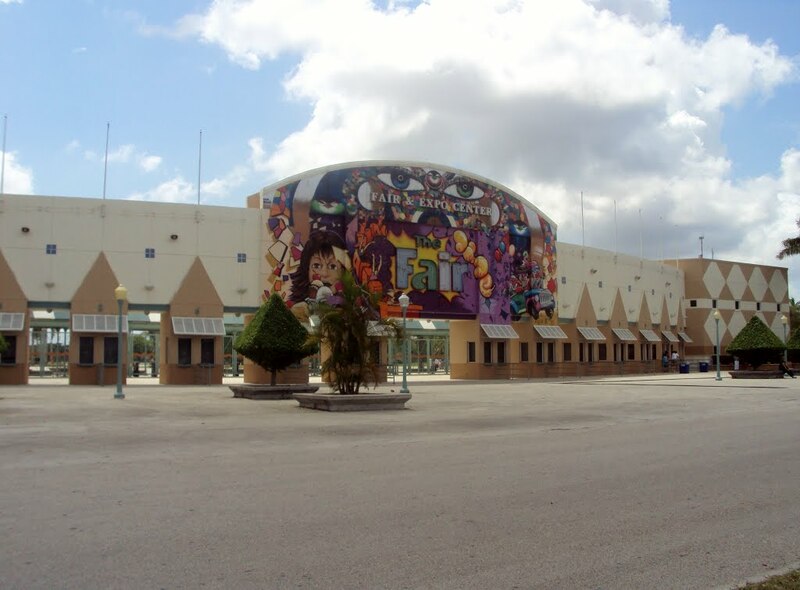 The new location will be the Miami-Dade Fair Expo Center, southwest of the Miami Airport, with new dates of February 10-13, 2017. Not sure at the moment if that means the show will stay one or two years at the new location. Moving back to Miami Beach and the new facility will be a pleasure. Remember the Miami Antiques + Art + Design Show, The Airport Show, will open to the public next Friday, January 22, 2016 at noon. We’ll be there with a very strong selection, so I hope you can make it. The following week the Original Miami Beach Antique Show will open to the public, as usual, at the Miami Beach Convention Center. You should attend, just for the memories alone. The Florida antique shows are about to begin. Yippee! 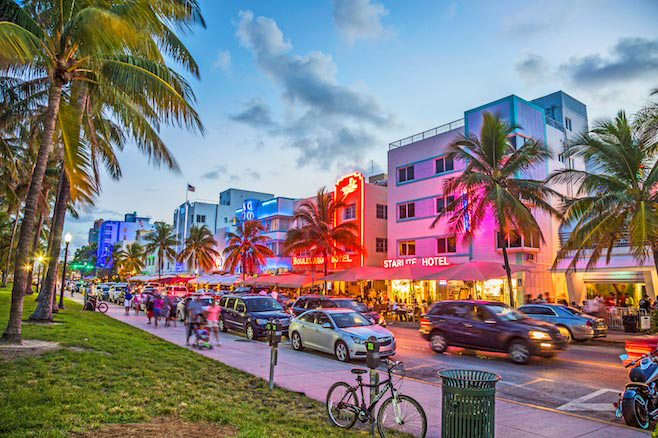 Next week buyers and sellers will converge on Miami from all over the world to transact business, making it an exciting time of year. 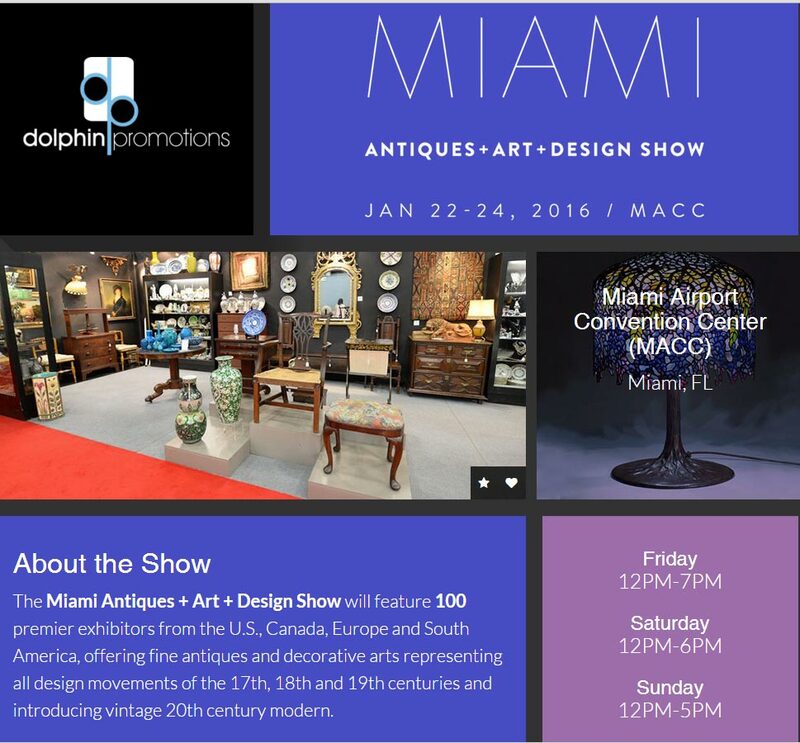 The first show is called the Miami Antiques + Art + Design Show, but is often referred to as the Airport Show. It will open to the public on Friday, January 22, 2016 at noon. Business is usually very good with lots of action — like Vegas, but without the gambling. Last year’s Airport Show was canceled by the promoter, U.S. Antique Shows, leaving a vacuum. Dolphin Fairs had sold the Airport Show to U.S. Antique Shows several years ago. When U.S. Antique Shows announced a few months ago they were folding the show, Dolphin Fairs stepped back in and started a new show to replace it. It looks and smells just like the original show, but isn’t. Got it? Antique promoters and dealers are not dummies. What’s better than doing business in warm, sunny southern Florida while the rest of the nation freezes? 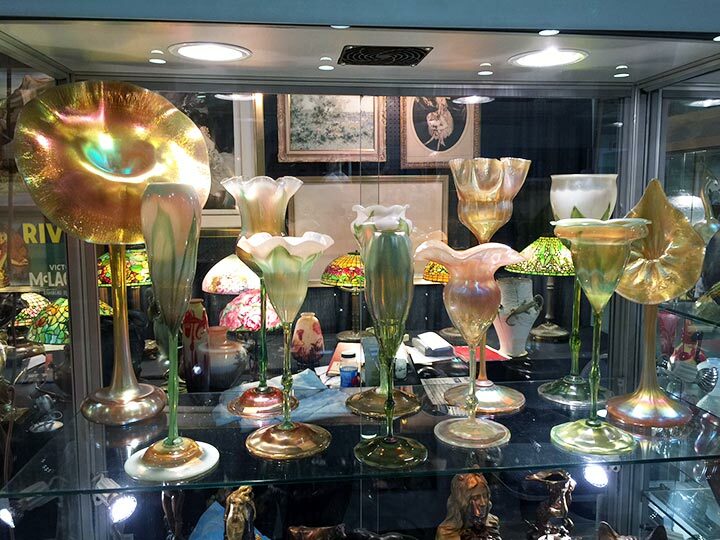 The following week will bring the Original Miami Beach Antique Show. May I suggest you come to Miami a few days early? Visit the Airport show first, rest a couple of days in Miami and visit the second show. You’ll get first crack at some of the merchandise you’ll see the following week. Need a place to stay or the name of a great restaurant? I’ve got answers, so make your arrangements now, if you haven’t done so already. 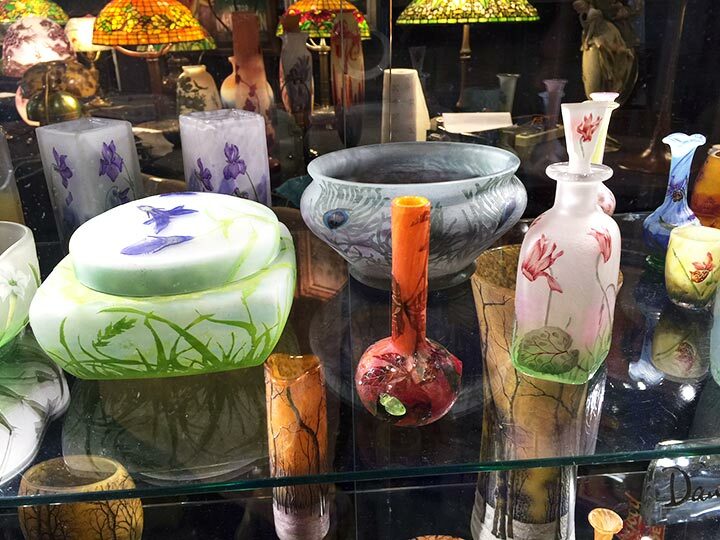 We will be bringing the best selection ever of the finest in American and French glass and lamps. You will not regret the decision to come, so make this the year you visit. You know you’ve been wanting to come. 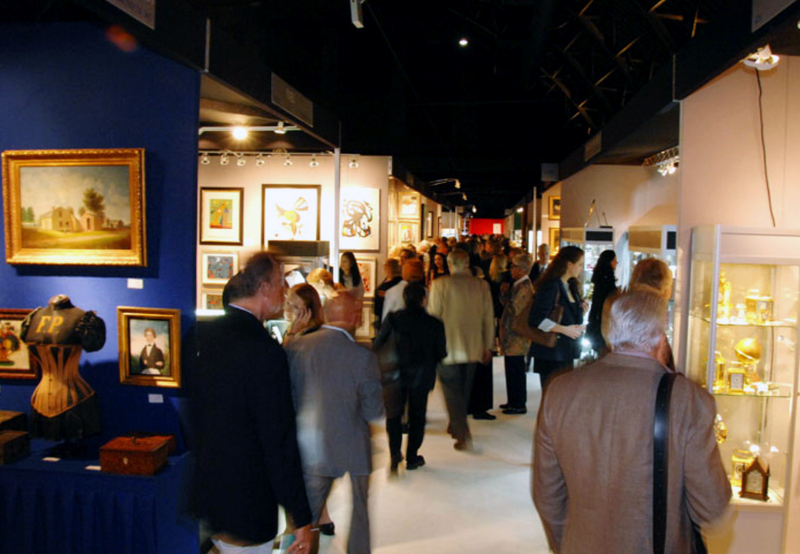 The following week the eagerly anticipated Original Miami Beach Antique Show will open to the public. 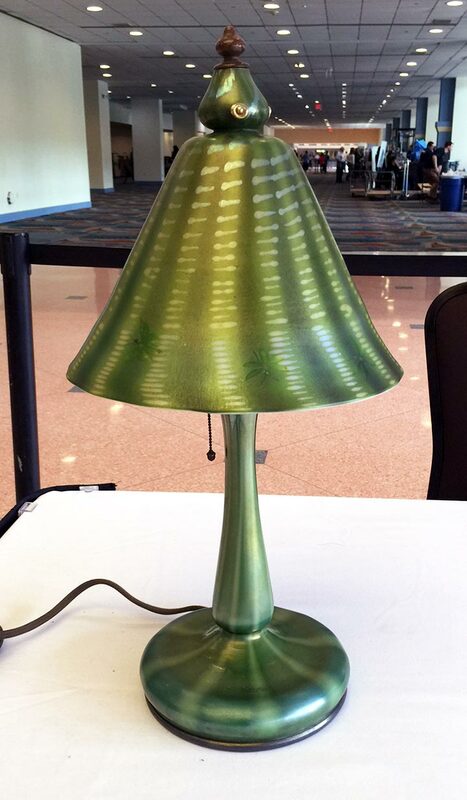 If you attend just one antique show the entire year, this is the one. The New York Art, Antique, & Jewelry Show has been running continuously at the Park Avenue Armory for 35 years under slightly different names and different promoters. (The current promoters are the Palm Beach Show Group.) Now Armory president Rebecca Robertson has decided to end antique shows in preference to live events. If she cannot be persuaded to change her mind, the show will have to find a different venue next year, which can only hurt. 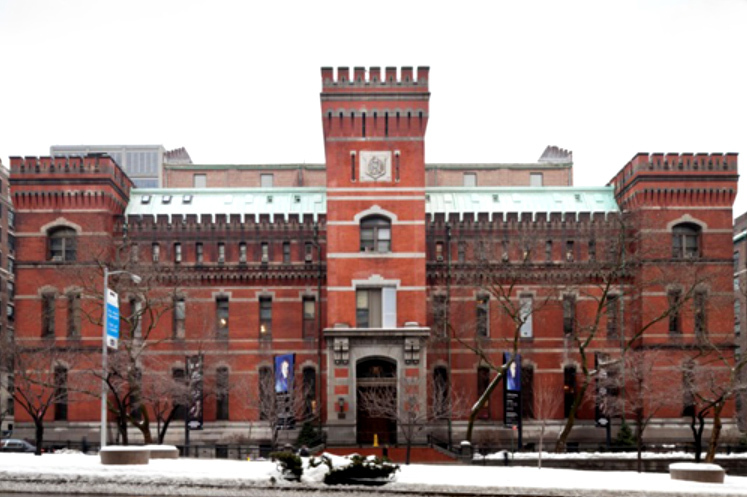 The Park Avenue Armory is an historic building in the middle of the wealthiest area of Manhattan. Billionaires (e.g. Carl Icahn and Ivana Trump) can just roll out of bed and walk to the Armory. It’s highly likely that the show will lose many of its best clients if forced to move to another venue. The New York Art, Antique, & Jewelry Show may not be the only show affected. The Winter Antiques Show, the New York Antiquarian Book Fair and the International Fine Art & Antiques Show may all lose their spots going forward. With a $65 million gift from the Thompson Family Foundation to encourage live events, Ms. Robertson is unlikely to change her mind. Personally it’s quite disappointing. With rumors that the NYC Pier Antiques Show will be discontinued permanently, I was hoping to exhibit at this show next year. Now all bets are off. I have no idea what will happen, but you can help by signing a petition to restore the show. Click here to sign. 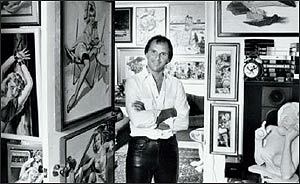 For the complete article from artnet news, click here. For the article from the New York Times, click here.